0 | 12 students enrolled. 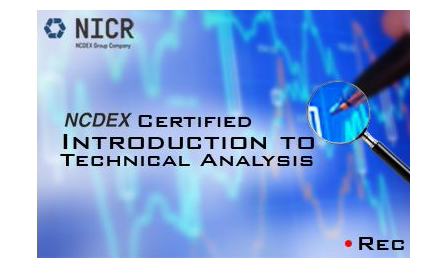 NCDEX Certified Introduction to Technical Analysis online course will help you in a step-by-step manner to understand and implement the various facts of basic commodity technical analysis. Considering the volatile price fluctuations in agri-commodities, it is always an added advantage to be able to gauge and analyse these price movements and benefit from them. Technical Analysis is an effective methodology which, if understood well, can be useful to trade both the trending and range-bound market. Our commodity technical analysis course has been prepared after a very meticulous review of market behavior and volatility of agri commodities. To gain expertise on various methods and tools to detect the pulse of the markets and determine the trend in which the prices are moving. Students enrolling for Commodity Technical Analysis programme will be given a “Certificate of Participation” from NCDEX facilitated by Elearnmarkets.com, after successful completion of the course. He shall also be given free access to related webinars conducted by Kredent Academy for further knowledge enhancement. An email query support, Question & Answer community platform will also be availed by the student for any kind of doubt clearance related to content while pursuing the course. All the knowledge content is provided by elearnmarkets. In case of any further assistance, drop in an email to support@kredentacademy.com or call: 9051622255. Pattern of questions: 50 multiple choice based questions of 2 marks each. Qualifying marks: 50%.No negative marking for this course. Certificate: Once the participant successfully clears the examination , he/she will receive a “Certificate of Participation” from NCDEX at their postal address.